Teeth whitening or bleaching is very safe and common these days. With whiter teeth, your smile and age appearance improves. You surely can smile more confidently and feel great about how nice you and your teeth look. There are many ways for patients to whiten their teeth. The most time efficient way is referred to as “in-office’ bleaching or whitening. This procedure is done in the dental chair in a very controlled and safe way to enhance your smile. During this procedure, a whitening solution is applied to the teeth in increments of 20 minute cycles. Usually 2 to 3 cycles are done to achieve the full whiteness of the patient’s teeth. The total appointment will take about 90 minutes. If a patient prefers to whiten at home, the dentists can make custom trays that fit perfectly over the teeth. The whitening gel is placed in these trays and worn for a specific amount of time depending on the strength of the product. Patients will usually repeat this process for 7-10 days depending on their results. 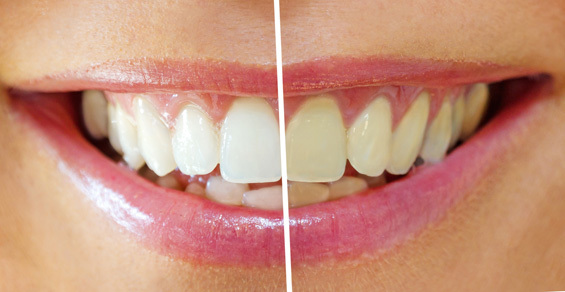 There are other options as well, please ask us today if you are interested in whitening your teeth. We are rather unique in San Francisco that we offer using laser technology as an option to whiten teeth so that it’s a faster process!